Mad Men Challenge 2 Complete! Phew... I did it! The deadline for the JuliaBobbin's challenge was extended until tomorrow and I got two dresses made with just hours to spare. Best part is the girls love their new dresses! Both dresses were made with Simplicity 4927. 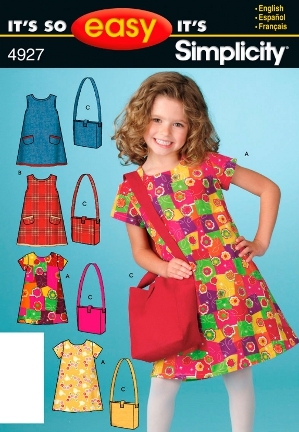 It's a simple A-line dress sized from Girls' 3-8. The shape and neckline really hearkens to the mid-late 1960s Mod fashion. For Abbie's dress I had to cut a size 4 for the bust/shoulder area, a size 6 for the waist, and a size 5 for the hip. I cut it to a size 6 length. Her dress was made with quilting cotton yardage I purchased from my friend Angie. She runs Sew-lutions on Facebook and two Etsy shops: Fabric4U and Patterns4U. She is offering a discount in both of her shops to my readers. As a Sew Damned Creative reader you are entitled to 10% off of $10 or more purchases (S/H not included) in both of her shops. Use code SDCREADER when you buy from her on Etsy. Evie's dress was cut to a size 5 in the bust/shoulder area, a size 7 in the waist, and a size 6 in the hip. I cut it to a size 7 length. Her dress is made with cotton yardage I purchased at Hancock Fabrics last year. It feels good to get this challenge done. It almost didn't happen. Next up I have to alter a bridesmaid gown into something more prom appropriate for a client before the end of the month. In May I'm going to be making some 1920s inspired lingerie for myself for the Great Gatsby Sewing Challenge. I'll also be making a 1950s cotton wrap skirt to wear with my bathing suit for the Accessory Inspiration contest at Pattern Review. I'm going to enter that into the natural fiber contest, too, as it will be made in all cotton. I took another break from the Joan dress because we had unseasonably hot temps here in Maryland and our AC is out of commission. Bleh. No desire to sew when it's hot inside like that. Well, it finally cooled off today and I came back to the lining that I had been working on fitting. The fit is fine but I'm just not crazy about the dress now. The square neckline is not something I'm really into (not sure why I even thought I would want it) and I'd much prefer a princess seamed dress instead of a darted one. So, I scrapped it. I still have the uncut shantung that I plan to make a cocktail dress from, but I'll revisit that idea closer to autumn. Very workable to look similar to mid-late 60's! And I can totally make two of these in the 6 days I have left. I'm going to have the girls pick out their preferred fabric in the morning. I have enough of both fabrics to make two dresses of each in case the girls want the same fabric. Changing my mind with 6 days left?! Maybe I am a little mad. I totally distracted myself last week with making the slip to go with my Sew for Victory dress. That derailment made me feel awesome when it was finished, though, so totally worth it! 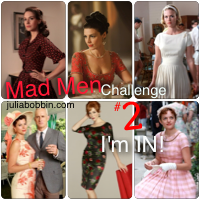 Now it's time to get back to work on my Joan inspired dress for the Mad Men Challenge #2 (see button on right). I really wish I had bought Fit for Real People (FFRP) when I first started sewing in 2010. It would have saved me so many headaches and heartaches over failed fitting attempts. 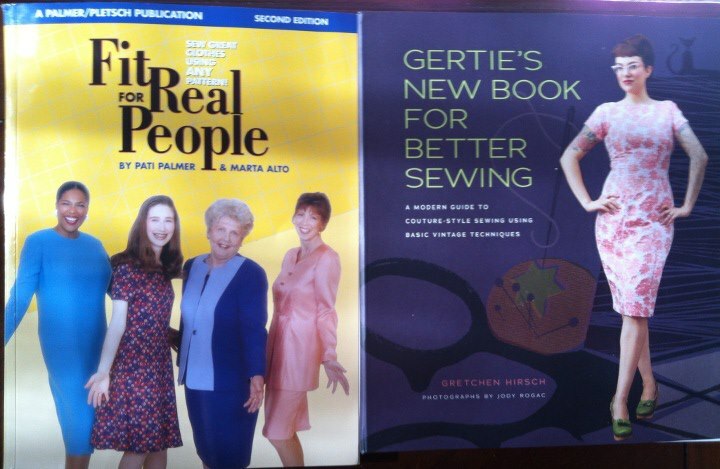 I inhaled the entire book that same evening it arrived and thumbed through Gertie's New Book for Better Sewing. I'm looking forward to trying out the projects and techniques in Gertie's book at some point but I knew I could apply things from FFRP to my Mad Men dress right now! After doing 4 muslins of McCall's 2401 (View C) I've totally lost my mind and decided to start over. I'm incorporating the techniques in FFRP with the pattern tissue. The changes I had made to the back already were spot on with what they say to do. My front, though, oh wow... did I ever have it overly complicated! I changed my wing-it approach to their Y Full Bust Adjustment and now I have a pattern tissue that fits my bust beautifully! It took 20 minutes, not 4 muslins, too!